After the craziness of Western States we escaped to the mountains in Colorado to rejuvinate. Coming back all of the sudden summer is in full swing here in Flagstaff. The summer rains have started and it is just a wonderful place to be. Salads full of fresh produce are the epitome of the season for me – to be consumed with good friends at barbeques or a quiet dinner in the back yard. While my garden is only just beginning to produce – we have our first few summer squash and a good amount of lettuce – the farmer’s market is a world of color right now. These salads are a tribute to what we can find in the market here in Flagstaff. While many people think about beets and carrots as a spring vegetable they are all over the place right now and are tender and delicious. Tomatoes are just starting to make their appearance here. I have had a real dairy obessession lately – it seems to eb and flow, right now the craving is strong. I am guilty of tasting cheeses at the cheese counter just to feed a fix! That is how I ended up with the nutty, buttery deliciousness of the 12 month aged manchego that I paired with roasted young carrots and beets for the first salad. Both salads feature cheese but would be equally good without. Happy summer everyone! I like to roast vegetables at a high temperature to get beautiful color. 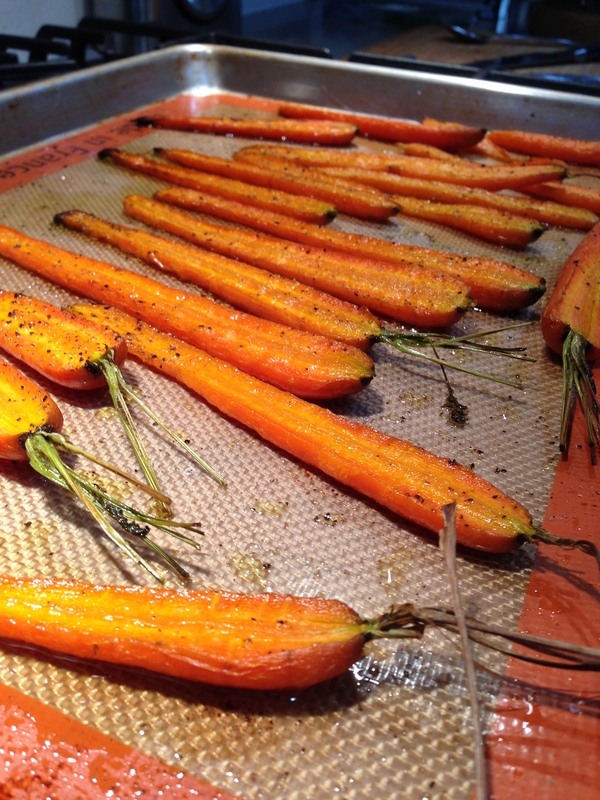 The carrots were so nice I just simply halved them lengthwise – you could also chop them into chunks. 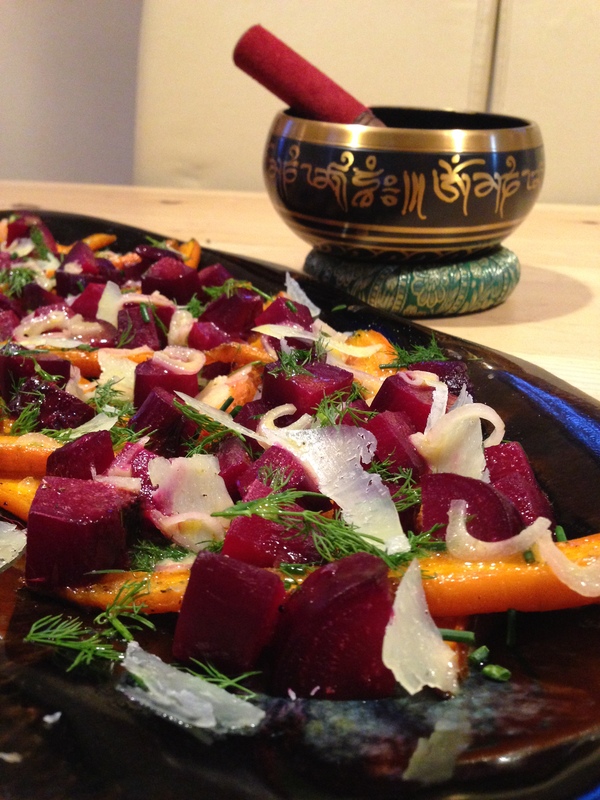 I always roast beets in foil with a splash of oil to maintain their juiciness. See the description of this technique in this recipe for Pink Salad. The earthiness of the beets pairs so well with the sweetness of the carrots and the cheese adds a wonderful complexity. Lastly the dill adds just the right fresh punch to round out the salad. 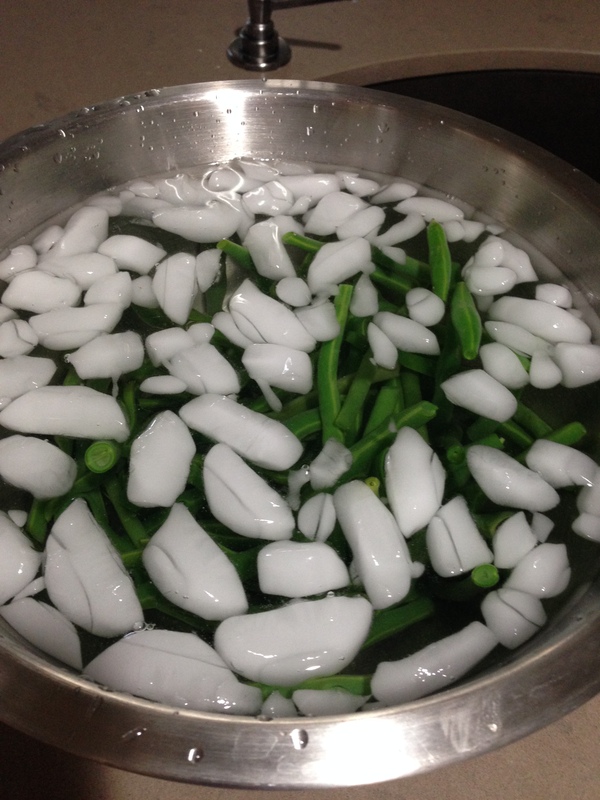 Crunchy steamed green beans are the star of this dish. I like to just trim them so they are quite long – if you prefer more bite size beans feel free to chop them up. I also marinated some feta in oil with dill and oregano that turned out really nice for some depth of flavor. Add some grilled corn and chopped heirloom tomatoes and it is summer in a bowl! This is all tossed in a simple vinaigrette. I have really been enjoying the nutty taste of the Flora 7 Sources oil and using it a lot in my salad dressings, give it a try! 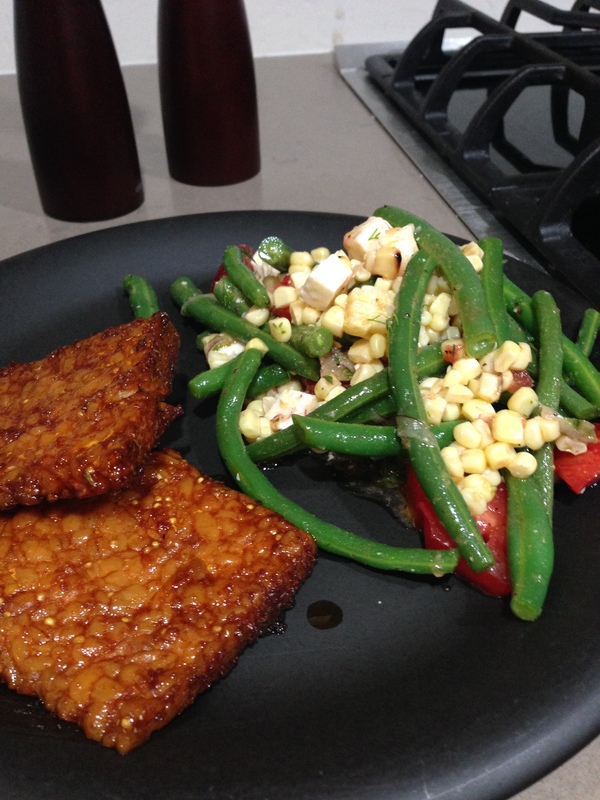 We served this simply with a few slices of BBQ tempeh – find the recipe here!